El Quelite Tour from Mazatlan - Save Here! 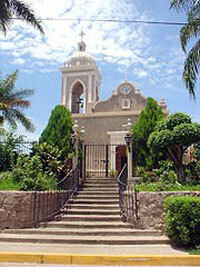 About 30 miles northeast of Mazatlan lies the picturesque colonial pueblito of El Quelite. The beautiful streets of this village are invitingly strollable and litter-free, mostly cobbled and lined with subtropical trees, shrubs, and colorful flowers spilling onto the sidewalks. Awash in color, the houses are painted bright hues of yellow, green, red, the complete rainbow. This town is so lovely that it inspired Francisco Terriquez to write the famous Mexican folk song, Que Bonito es El Quelite (How Beautiful is El Quelite), which is well known throughout Latin America, and can be heard playing regularly throughout the town, a demonstration of how proud the 2,000 people who call this pueblito home are of their village. Free pickup in your hotel lobby or at your cruise ship pier in an air-conditioned mini-van or mini-bus. 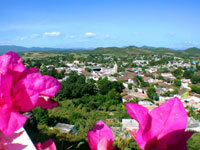 Visit the town of El Quelite, one of the most beautiful colonial villages in Mexico! Enjoy a walking tour of this picturesque town, with lovely streets and cute red-roof tile houses full of color! Visit a rustic bakery where you can taste a great bread with a local family, and enjoy Queso Fresco (fresh cheese) with tortillas and sauce! See a real cockfighting training ranch, where roosters are trained for this very Mexican sport. Visit the ancient cemetery where even the crypts are beautiful! Enjoy lunch (optional) at the most beautiful place you can imagine! After the tour, we return you to your hotel or cruise ship pier. Cruise Passengers: Yes! This excursion is available to you and will work with most cruise schedules. Pick-up and drop-off from your cruise ship pier is even included in the price! Runs: Daily at 10:00 AM. Public Price Our Price You Save! Tasting the fresh pineapple turnovers at the bakery is almost worth the trip just for that!